The To-Do is considered a type of content. Please review Adding Content for a full explanation of how content is added in various places throughout Project Insight. To-Do's are used as reminders of things that need to be done but are not project tasks. There is no time tracking or billing associated with a To-Do. 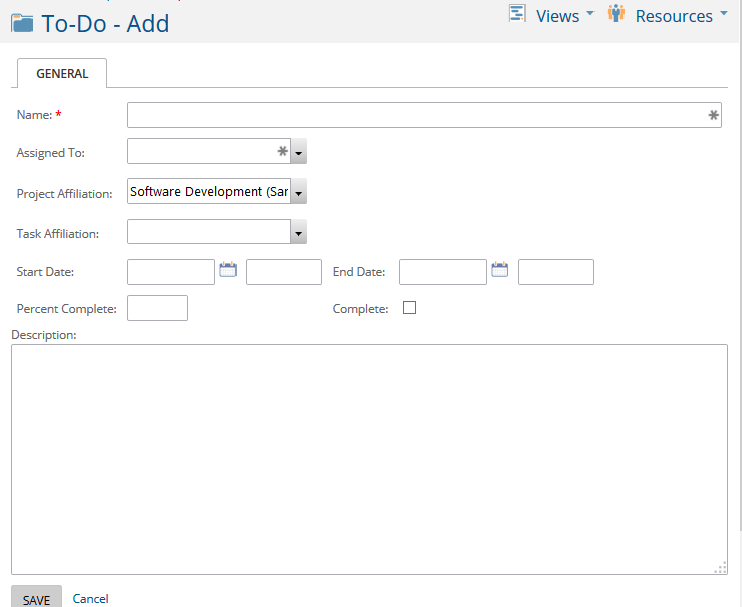 A new To-Do item may be added using the add icon and selecting To-Do. Name is a name assigned to the To-Do. Assigned To is the Project Insight user who needs to do the item. Project Affiliation can be used to note what project the To-Do is related to. Task Affiliation can be used to note what task the To-Do is related to. Start Date is the date and time the To-Do should be started. End Date is the date and time the To-Do should be done. Percent Complete is a text box where a number can be input as a matter of keeping up with how much of the To-Do has been completed. Complete is a check box to be used when the To-Do is completed.